comfy pj's, originally uploaded by indiaeden. Or maternity pyjama pants depending on your point of view! I made these this afternoon,I used a maternity trouser pattern Simplicity 8530. They make great,comfy,roomy pj pants, but honestly I would never wear this design outside of the house as day wear, they really do look like clown pants, especially if like me you try them on over rainbow stripe knee high socks! The fabric I used is a cotton flannel, I made a cropped length and added mint lace to the hem. The waistband is adjustable with button hole elastic. Woody did take modelled pics,but really that's not something I need to subject you to! They go very nicely with the mint green t shirt I bought in Tescos today. (fairtrade cotton t shirts Two for £6). 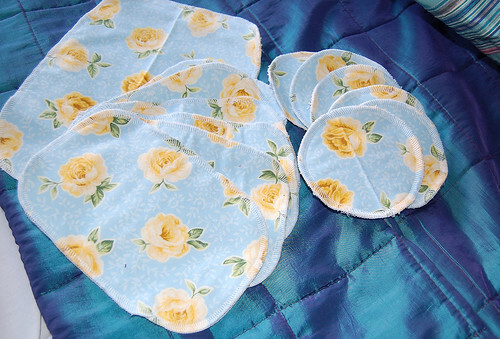 I made some washable wipes and breastpads with the scraps too. are you working your way through all those matty patterns then? glad to see they are getting use!